Helix’s mission is to provide a comprehensive education that prepares all students to graduate college-ready and equipped to reach their personal and academic potential. It is of vital importance that students are prepared for the next level, whether that be college, the military, or a career. It is our belief that a solid high school education that prepares students for college also gives students a solid foundation to become part of the work force or our armed forces. At this time of year, it is exciting to see our seniors begin to make decisions about their futures. College applications have been submitted, and students are receiving acceptance notices and deciding where they might go. A large part of this decision is based on finances. As we often hear, the cost of a college education can be prohibitive. Some students who would choose to attend a college or university are unable to do so because of simple economics. In an effort to combat the high cost of higher education, Helix implemented a few programs to help students achieve their goal of attending college, should that be their choice for their future. First, Helix has on staff a full-time College Access Counselor. Besides helping students decide where to apply and supporting them through the application process, the College Access Counselor assists students in completing the Free Application for Financial Aid (FAFSA) forms. The majority of students across the country qualify for some kind of financial aid, so completing the FAFSA is an important part of defraying the cost of college. The College Access Counselor is also a great resource for students searching for opportunities to apply for scholarships. Another program in place at Helix is the Dual Enrollment program. At Helix, students can enroll in college courses taken on the Helix campus as part of the students’ regular school day. The courses are taught by Helix teachers who are qualified to teach community college courses, or by college professors from Grossmont College. These courses count both as high school graduation requirements and actual college credit. This program helps to offset the cost of college because first, there is no cost to the student to take these courses, and second, students can complete part of their college education early, cutting down on the number of semesters students must pay for before getting a college degree. Helix is also fortunate to be supported by the Helix High School Foundation, which facilitates fundraising that promotes the growth and improvement of the programs, facilities, and activities at Helix. 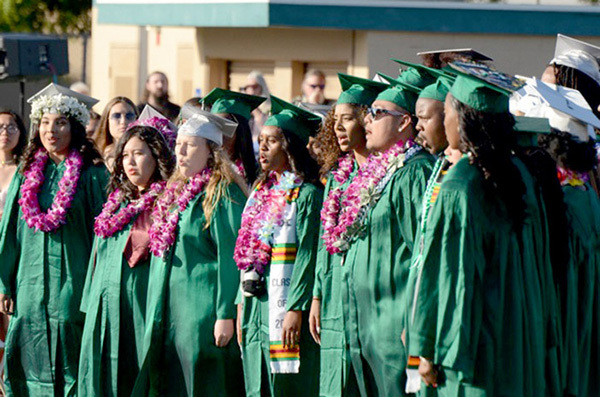 Every year, the Foundation raises funds to provide thousands of dollars in scholarships for graduating Helix seniors. Funding and the participation of community members are always required to reach the goals the Foundation has set. The Foundation also holds various social events such as a wine tasting event and the annual Highlander Open Golf Tournament. To become a member of the Foundation and help provide college scholarships, visit their website at helixhighschoolfoundation.com. We are looking forward to hearing about all of our students’ plans for the future as the class of 2019 gets closer and closer to graduation! Enrollment for the 2019-20 school year is in full swing. Any student interested in new enrollment for next school year must attend and informational meeting to obtain an access code for our online enrollment system. Meeting dates and times, and detailed enrollment information are available by visiting helixcharter.net, then access the Entrance Boundary/Lottery Information link. The Highland Players present “Urinetown, The Musical.” In a Gotham-like city, a terrible water shortage, caused by a 20-year drought, has led to a government-enforced ban on private toilets. The citizens must use public amenities, regulated by a single malevolent company that profits by charging admission for one of humanity’s most basic needs. Amid the people, a hero decides that he’s had enough and plans a revolution to lead them all to freedom! Show dates are Jan. 31, Feb 1, 6, 7, 8, 9. All performances are at 7 p.m. in the Helix Performing Arts Center Mainstage Theater. Tickets are $10 and are available at highlandplayers.ticketleap.com. The Helix Instrumental Music Department’s Annual Giving Gala is coming up on Feb. 23 at 6:30 p.m. Enjoy delicious food, drink, live entertainment and bid on awesome items in live and silent auctions. For tickets and more information, visit helixinstrumental.ticketleap.com. If you are interested in finding out more about Helix Charter High School, please attend one of our Excellence in Education Tours, held monthly. Upcoming tours will take place on Feb. 1 at 8:10 a.m., Feb. 13 at 9:10 a.m., and Feb. 28 at 5:30 p.m. Reserve your spot using our website, helixcharter.net. —Jennifer Osborn writes on behalf of Helix Charter High School.